Allan Quatermain may be British born, but that doesn't stop him from loving Marie Marais, a Boer maiden in South Africa. Nor does it stop her from returning his love, although their marriage ends in tragedy born of racial hatred. Shelly Frasier transitions easily among British, French, Dutch, and American accents in her sober performance of this classic, sometimes within the scope of the same character. While this occasionally leads to confusion, her thoughtful narration of the sad and frustrating story keeps the listener riveted from one distressing scene to the next. While the cultural disputes of 1830s Africa seem insurmountable, Frasier's compassionate portrayal of Haggard's text makes the listener yearn for a peaceful solution. Allan accompanies the ill-fated Pieter Retief and the Boer Commision on an embassy to the Zulu despot, Dingaan. Villains attempt to kill Allan and rob him of his wife. The unfortunate mission ends in a blood-curdling massacre. 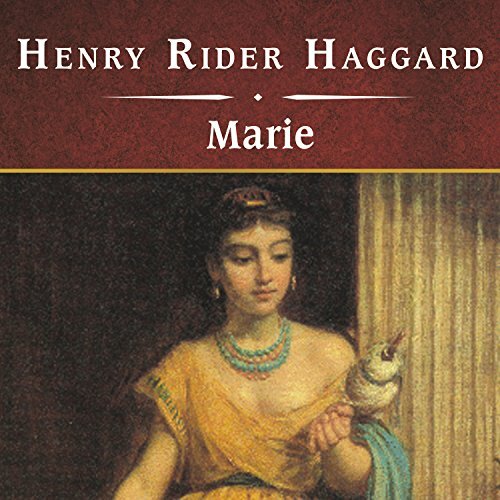 Written at a time when slavery was widespread, Marie portrays characters and views reflective of its era. ©2001 Tantor Media, Inc. (P)2001 Tantor Media, Inc. The narrator switches between British/French/Dutch/American accents for the same character and sometimes even in a single sentence! This is very strange and makes it highly confusing to understand which character is speaking, since the same character switches between four different accents. I could not listen to more than a couple of chapters of this book, as a result. This is one of the best Allan Quatermain books. If you enjoyed King Solomon's Mines, you we definitely enjoy this book. The narration is very good. Would you listen to Marie again? Why? Absolutely, this is easily one of his best novels. What was one of the most memorable moments of Marie? Without a doubt the raid on the Marais property. You could feel every thrown spear and every bullet shot. Fantastic! Have you listened to any of Shelly Frasier’s other performances before? How does this one compare? Yes, She is impeccable. She is superb in her reading, not too melodramatic, just right. One of my favorite narrators. Yes, unfortunately real life got in the way. Please produce more of the Quatermain novels for Audible. There are only about five so far. Please record the others.